Chef Rick Teoh of Toh Yuen, Hilton Petaling Jaya and his team will pull out the stops to ensure diners welcoming the Year of the Rooster sit down to a choice of three festive set menus, to ensure a prosperous beginning to the Lunar New Year. Our dinner preview hosted by the Hilton PJ Marcomm team led by Brin Vinda saw us tossing with gusto the platter of colourful Prosperity Yee Sang (raw fish salad) with Fresh Salmon, Hokkigai (surf clam) and Top Shell. As expected, the succulent slices of raw salmon, surf clam and top shell blended well with the mixture of pickles, crisps, shredded vegetables and condiments. The salad had the right amount of sauce and oil; every mouthful deliciously well-balanced in texture and taste. As tradition dictates, every festive banquet would invariably feature soup. Although yours truly hardly bother with broth or soupy stuff, I am partial to certain thickened version like the Brasied Superior Broth with Bamboo Pith, Sea Cucumber, Fish Lips, Egg White & Crabmeat served. Velvety smooth thanks to the chunks of egg white and endowed with rich nuances drawm from the luxe melange of premium items, few diners would pass up on savouring this. One of my fave dishes of the eve was Steamed Canadian Cod with Dried Orange Peel & Julienne Ginger. The milky white flesh - delicately scented by the strips of dried mandarin peel - was marble smooth while the flavourful soya sauce and fish jus proved good enough to lap up. 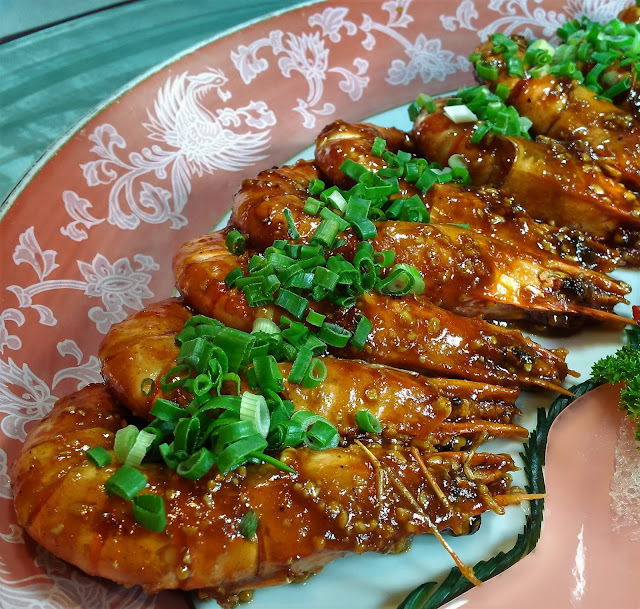 I have yet to come across any CNY menu without the ubiquitous 'hou see fatt choi' and it's a good thing too as the dish is cherished for its auspicious symbolism of 'good tidings and burgeoning prosperity'. Hence everyone thoroughly relished every morsel of the Braised Shell Abalone, Mushrooms, Dried Oyster & Seamoss offering. Slicked with glossy brown sauce, this was a surefire crowd-pleaser through and through. Happy laughter is sure to follow when there are prawns on the dining table. Despite the high prices, most CNY menus would include crustaceans with chefs giving their creative touches to them. 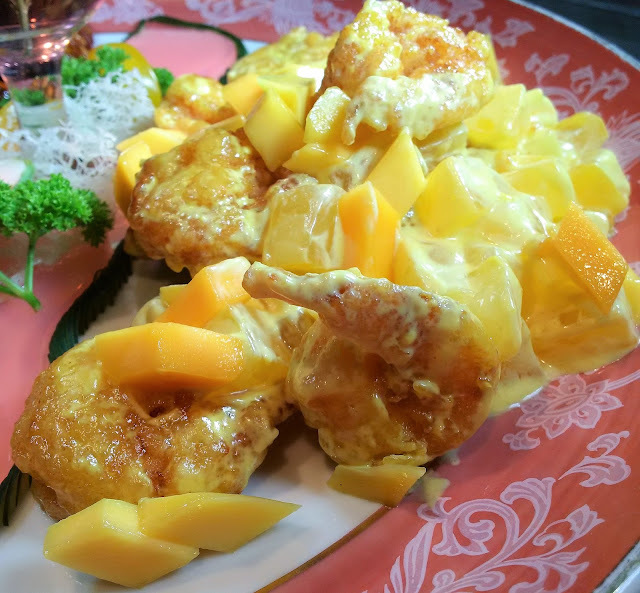 Thumbs up to the dual platter of Fried Tiger Prawns with Oriental Sauce and White Prawns with Mango & Mayonnaise. We love the strong, robust flavours from the sauces used and the prawns' fresh bounciness were unmatched. The musky aroma of dried oyster permeated the hearty parcel of Hong Kong-style Glutinous Rice with Dried Oyster in Lotus Leaf. A salted egg yolk lent it scant richness. best of all, the overall savouriness was balanced ingeniously by a spoonful of subtly sweet chicken floss and chopped spring onion. Dessert fortunately came in manageable portion: a piece of Crispy Fried Nian Gao accompanied by Chilled Creamy Yam Puree with Vanilla Ice Cream. I'm partial to yam so both treats hit the spot without leaving any cloying feeling. Available now until 17 February, Toh Yuen's three sets menus are Everlasting Happiness (RM1,888 nett), Luck & Joyfulness (RM2,188 nett) and Sea of Prosperity (RM2,688 nett). For reservations, call Toh Yuen, Hilton Petaling Jaya, tel: 03-7955 9122 x 4073.